Just over a week ago, I wrote a post about donkey roping. It was read by other bloggers with larger readerships who also took the time to share it and speak out against a real injustice. It spread to friends and friends of friends, got posted on Facebook and written about by more bloggers. People all over the world wrote letters and made phone calls, inundating the little town of Van Horn with the message that donkey roping is just not acceptable. This afternoon, I got word that the Culbertson County Sheriff's office had canceled the donkey roping event because of the public outcry. We did it. All of us. There is one very important thing to keep in mind however, and that is: Jason Owens (432-940-9051) still owns these 40 donkeys. There are still other rodeos and other promoters out there. PVDR is still ready and willing to take them if he will relinquish them so keep calling. The really good news here, is that we have set a precedent. A precedent that I devoutly hope will be noticed by other towns and other promoters who may be thinking about scheduling a donkey roping event. We have won a huge victory today. But, the donkeys still need us. Jason Owens was right about one thing, these donkeys may well have starved to death if he didn't buy them. The donkeys need us to come up with ways to educate the general populace about the wonder of donkeys. They need us to come up with ways of promoting them in a healthy and meaningful way. They need us to show the world that they are valuable, that they are not cheap, disposable targets for abuse. You, readers, have proven today that you are a resourceful, determined, intelligent group who has real power. We have generated a huge amount of momentum and attention, let's keep it going and lets use it! Send in your suggestions and ideas. What do donkeys bring into YOUR life? How can we demonstrate this to a largely disinterested populace? How do we show the world that donkeys have value? Put you thinking caps on folks and let's use what we have created here to give donkeys a giant step forward. Thank you, thank you, thank you for all you have done. Donkey roping is an extremely cruel 'sport' where the donkey is shocked with a cattle prod until he tries to run away, once he is running people on horseback run the donkey down, throwing a rope around it's neck, and another one around its rear legs. Once roped the donkey is then stretched between two horses. Broken bones and death are all too common during these events. 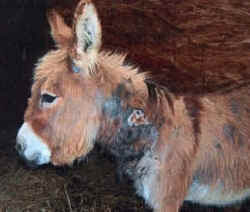 And that is the physical harm done, most donkeys take years to recover, if still alive, from the emotional trauma of abuse. My own grandson has autism and the first time he saw a "roping" donkey said he knew how the donkey felt.....alone, hurt, sad. Luckily that donkey was rescued from a hellious life as a roping donkey and came to live at Morning Bray Farm not far from us where my grandson is now able to help make that donkey feel whole, loved and happy.